Looking for resources or support for your Sparq system? You’ve come to the right place. Please contact us if you need further support or have any concerns. How can I tell if the Quad 1200 inverter is working? The status LED on the Quad 1200 will be flashing green when working correctly. If the LED is flashing Red, this indicates an AC issue so check the AC breaker. If the LED is amber, this indicates a ground fault was detected so check for faulty DC wiring then connect to the SparqLinq and go to the "Settings->Inverter Management" page and click the Clear GFDI (blue lightning bolt) icon. What is the maximum allowed inverter load ratio (DC/AC ratio) for the Quad 1200? The data sheet suggests a maximum DC module rating of 350W, but the Quad 1200 is designed to work with 60 cell modules with STC ratings up to 390W or a 1.3 DC/AC ratio. How do I calculate the maximum PV source and output circuit voltage of an installed system (this is to do with 64- 200 (1)(b) of the CEC 2015 code). The Quad 1200 microinverter has 4 independent inputs that are transformer isolated from the AC output and have their negative DC inputs referenced to ground thru the GFDI circuit. Considering the inverter handles each module individually, the calculations are below for the 64-200 (1): • the rated operating current and voltage; this is the module maximum power current (Imp) and module maximum power voltage (Vmp). • the maximum photovoltaic source circuit voltage; this is equal to the PV module's open circuit voltage (Voc). • the rated short-circuit current; this is equal to the PV module's short circuit current (Isc). The Trunk cable used with the Quad 1200 connects the AC output of all inverters in parallel. This means the voltage on the trunk cable remains the same (240Vac) but the current from each inverter (5 Amps) gets added. A trunk with 5 inverters connected to it will have 5 x 5A = 25A under full power. Adding a 1.25 safety factor gives a design current of 25 x 1.25 = 31.25A. There is no data displayed on the SparqVu Dashboard page. Try connecting to the SparqLinq Dashboard page and see if data is being logged. If so, power cycle the SparqLinq and then review the SparqVu site after about 10 mins. If there was several days of backlogged data, it may take a while for the data to be updated. How do I register my project on the SparqVu site? On the SparqLinq dashboard, click on the menu icon (three horizontal bars) in the top left corner of the dashboard page then select the SparqVu Token option. Enter the full email address that was used to create the SparqVu account and click “Generate Access Token” and copy the Project ID and Token values. Login to your SparqVu account and click the add a new site button, paste the project ID copied from the SparqLinq into the project ID field on SparqVu. Click the Go to Security Check button. Enter the Token copied from the SparqLinq and click Check Access Token. The SparqLinq should now be added to this SparqVu account. How do I register for an account on the SparqVu.com website? Go to SparqVu.com and click on the Register tab. Under "Register for A New Account" enter your email address and a password twice then click Register. Go to your email account and click the activate link. The SparqLinq Dashboard page “DAY DETAILS” reports “No data for the selected day”. SparqLinq missing data may occur if the time and date was not restored correctly from an internet time server when the SparqLinq was last power cycled. This causes the data to be stored under the default date set in the SparqLinq, instead of under today's date. To check this, go to the "Settings->Installation Information" page. At the bottom of the tab, the box titled "Current Date and Time" will show something like "2018/06/30 12:55:44". Look closely to see if it is correct. If it is wrong, edit to the correct time and date then press enter. How do I connect to the SparqLinq Wi-Fi AP (Access Point) after connecting it the customers Wi-Fi? My SparqLinq is joined to most Quad 1200's but some are distant and not connecting. What can I do? Plug the SparqLinq into an extension cord and move it to different locations (possibly outside or up on the roof) and try joining to the inverter using the “Settings-Inverter Management” tab. 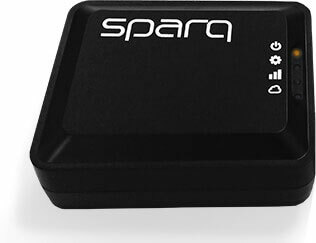 It is important that the Quad 1200 be first joined to the SparqLinq before it can start connecting to other inverters in a mesh network. Put the SparqLinq in a Non-metallic weatherproof box on the roof to get it closer to the inverters. 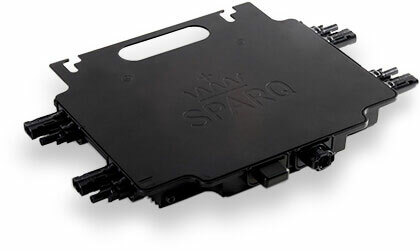 It may be necessary to use a second SparqLinq to connect the additional inverters. If the inverters have been joined to the first SparqLinq you will need to go to its “Settings-Inverter Management” tab and click on the "X" in the Release column before the Quad 1200's can be joined to a new SparqLinq. Two or more SparqLinqs can be monitored on the SparqVu website but there is no function to allow pairing the sites together. We’d love to start a conversation with you. Please contact us to view our installation and operations guides. A revolutionary, new microinverter that is resetting industry standards for cost, ease of installation, reliability, energy harvest and advanced grid functions. These features, backed by a 25-year warranty*, offer best in-class returns on investment. Offering low cost power conversion in a compact 1200-watt footprint. Part of a revolutionary, new microinverter system that will reset industry standards for low capital cost, ease of installation, high reliability, high energy harvets, and advanced grid functionality. Paired with the advanced Q1200 micro inverter, solar photovoltaic systems have never been so advanced.